Don't settle for any old boring paper megaphone. Create an easy felt-covered paper megaphone that stands out from the crowd. This megaphone can be adapted for any use, but works exceptionally well to show off team spirit at sporting events and spirit days. 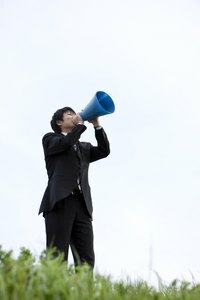 The megaphone's paper foundation can be used without any felt or decoration for low-cost backyard play, or the poster board paper can be quickly decorated with markers and crayons. Roll a full sheet of poster board into a cone shape. Start the roll at one corner and continue to roll the paper over until you have a large cone. Tape the paper seam down so that the paper does not unroll. Trim the excess paper off of the wide end of the megaphone. Wrap the paper megaphone with felt. Cut away the excess felt. Glue the felt to the poster board with hot glue. Measure the wide end of the poster board. Cut a 2-inch wide piece of felt the same length as that measurement. Roll the felt lengthwise. Hot glue the rolled felt around the wide edge of the poster board to create a rim around the end of the megaphone. Measure the small end of the poster board. Cut a 2-inch wide piece of felt equal to that length. Roll the fabric. Hot glue the rolled fabric to the small end of the poster board to create a mouth piece. Spray the megaphone with adhesive fabric spray. Shake glitter over the surface of the megaphone. Let the glue dry. Decorate the megaphone with fabric paint or hot glue gemstones on to embellish, if desired. Cut a 2-foot section of grosgrain ribbon. Tie a knot in one end of the ribbon. Slide a pony bead over the untied end of ribbon until it rests on top of the knot. Place at least six pony beads onto the ribbon. Tie the loose end of the ribbon into a knot. Make sure there are three pony beads on each end of the ribbon. Tie the center of the ribbon around the mouth section of the megaphone. Use sport beads to add more decoration to the spirit ribbons. Alternate grosgrain ribbon with curling ribbon around the mouth of the megaphone. Select several sizes and colors of ribbon to create a dramatic look.